On April 18, 2014, at 6:35 am, a small section of an ice serac released onto the Khumbu Icefall. 16 Sherpas were killed in a moment as tons of ice fell, leaving the mountain workers with few options and nowhere to hide. Today, four years later 2018, there is no climbing on Mt. Everest. No Sherpas, no foreigners – everyone is in solemn unity remembering where they were that day, and who they lost. We had great puja ceremony yesterday and our entire teams felt blessed. Today April 18th is Memorial Day of 16 sherpa’s hero’s lost theirs life during the 2014 tragic avalanche on khumbu icefall. This day is extremely difficult and super painful for me and many of my fellow climbers friends and their family. The entire Everest base camp remain silent not involving any climbing activities to remembering those heroes, sending our thoughts and prayers. Om mani Padme hung, Om mani padme hung, Om mani padme hung. May those heroes Rest In Peace. Many lost long time employees, friends and in many cases, family. There is no chasm between the operators or agencies about this day. They speak in quiet tones about great climbers, young and old, Sherpa Guides. They talk about their base camp doctors or the cameraman trying to record what makes Everest so special. Avalanches know no profession, no nationality. They are random and often fatal. Brice and others – western and Nepali – are back this year. When asked why, he simply says “It’s the right thing to do.” The cynical will bring into the conversation how much Sherpas are paid, the profit margins and the tired old line about Sherpa exploitation by western operators. If you ask the Sherpas, they will acknowledge the danger and the income that comes from guiding. They are pleased that about 350 foreigners are climbing Everest in 2018. All foreign climbers are with a team that includes climbing Sherpas, cooks and countless porters. They stayed in Kathmandu hotels and ate in Kathmandu restaurants. As they trekked towards base camp they stayed in teahouses, ate their meals there. Their gear was transported from Kathmandu to the Khumbu on Nepali owned airlines. 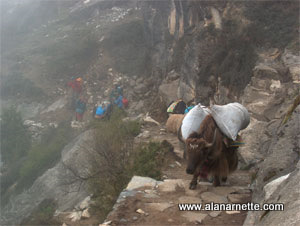 Local porters carried them further up valley. Yes, the $11,000 Everest permit fee goes to the government and the western and Nepali companies earn a profit however a large part of the revenue, both direct and indirect that a climber pays, goes right back into Nepal. This is why Brice, and other operators are back. They know that what they do goes beyond helping members stand on a summit. Today’s remembrance is not a justification for climbing. It is not a marketing ploy to attract more climbers or sympathy. It is not an opportunity for another “adventure” magazine to sell advertising based on reciting decades old myths that are no longer valid. However, to be clear, not much has changed for the mountain workers other than increased life insurance. But the fault lies not with Western Operators as is often cited – in fact they have supported their staffs in levels high above the non-enforced laws. The fault lies with the Nepali Ministry of Tourism which has had multiple Ministers over the last several years. The lack of stability in the government creates a random series of rules and no enforcement on the mountain. A fractured government and a diverse ethnic population prevents further progress for the Sherpa people, and others who work in mountains. The Sherpa people are viewed as already having a lucrative lifestyle and incomes by the rest of Nepal. These views generate jealousy and stalls further advances in safety and wages by the Ministry of Tourism. But these facts are ignored while the complexities are real. A solution is not simple. Yes, climbers can stop climbing Everest, but what would that accomplish and who would suffer the most? Last year when I was in Kathmandu, I met with Kami Sherpa’s son. I summited Everest and K2 with Kami and stood side by side in the Western Cwm during the 2015 earthquake. Kami’s son, Mingma, is an impressive young man. He is now 23 and graduated with an Electrical Engineering degree in Kathmandu. He will work for a hydroelectric company. Mingma said he wanted to be a mountain guide like his Grandfather, father and second oldest brother but Kami wouldn’t let him. He said he liked the idea of adventure. Interestingly, his mountain guide brother makes fun of Mingma for going to school and not earning as much money as he does guiding. His two sisters also go to school in Kathmandu. One wants to be a doctor, the other just graduated with a degree in Hospitality Management. By the way, Mingma’s English is perfect. He was born in the stone house where Kami and Lhapka live today, like all his brothers and sisters. He went to grades 1-5 in Pangboche then to the Hillary school in Kumjung to grade 7. When Kami sent him to boarding school in Kathmandu, they dropped him back to grade 5 because his English was so poor. He went on to graduate high school and now graduated from the university. The pressure is huge for them to stay in the Khumbu and make a few quick dollars guiding for 2-4 months a year but Kami wanted a better life for his younger children – and he is seeing that come true. Mingma’s tuition is about US$2,000 a year, his sisters about $600 each. Most Sherpas employed by western guide companies will make about $5,000 guiding this spring, the low-end Nepali guide companies will pay their staff half or less for the same work. This is the quiet secret members never understand when getting a “deal” with their outfitters. Kami’s hard work is benefiting his children. He has the same dream as parents everywhere – for their children to have a better life than they do. Today is a day of memories. A day where a family in Portse, Pangboche or Thame remembers their fallen husband, son or father. They are grateful for their sacrifice that allowed their children to receive an education – something they never had. They are grateful that their son or daughter will not become an Everest guide. They understand the juxtaposition between risk and reward. They understand that mountains are dangerous and if they had alternatives, they would have taken it. Their tears are real and visible today. Today is a day of memories, and dreams. Are you sure about this, Alan? I was climbing Lhotse in 2014 and witnessed many of the events. I remember IMG’s Sherpas being some of the most vocal that the mountain should be closed following the tragedy. If the dispatch is correct then it’s interesting that they are now one of the teams who are choosing to climb rather than mark the anniversary by staying at base camp. Peace to those lost on the mountain and to those who love and miss them. A wonderful, and heartwarming article. May those that died on that fateful day in 2014, as well as all the other people that have died on the mountain, may their souls rest in peace. Thank you Alan. That was a horrible day that I will never forget.